Do you know that the average time between hair appointments for ladies is 3 months? To stay presentable, to prevent hair roots from being too obvious and to ensure there are not too many split ends that is the number one reason why your hair looks frizzy! I visited The Comb Salon for my most recent hair appointment and was pleasantly surprised by how fast and effective they were at helping me revitalize my hair, which makes it perfect for your regular hair maintenance. The hair that needs some desperate saving. I have left it to grow out naturally but it has reached a point of being really unsightly. To my horrors, I found a lot of split ends in my hair - I used to think that split ends refer to the classic Y shape, but no... knots and right angles are notoriously good at making your hair look super frizzy. It means you need a really good trim to keep your hair in shape again. The Comb is located in Gemmill Lane, close to Raffles Place, Chinatown and Telok Ayer MRT. This means all the office ladies nearby can come down for your hair maintenance easily. Stepping into The Comb, it feels really elegant, clean and sleek. This white and wood combination never fails to make me feel so at ease. The Comb is a super popular Korean hair salon in Singapore. It is helmed by Creative Director Rina Kil. This hair salon was designed with a comfortable atmosphere and a “straight to the point” solution- solving central principle in mind. From what I observed with how they treat the other customers, the team at The Comb are super serious with their work, ensuring that their customers are comfortable during their service, and that every customer walks away happy and satisfied. My stylist is Ryan Jin, a senior stylist at this beautiful hair salon. I would recommend him definitely for his hospitality, skill and speed. When I entered, I was ushered into a seat, and after I settled down, I was given the nicely decorated service menu and asked to choose the tea or coffee that I want. They provide a premium range of TWG tea and freshly brewed Nescafe, which is pretty impressive considering other salons don't put in as much effort in this aspect. The latest magazines are available here - with a good selection of Vogue, and other local magazines which kept me entertained throughout my time here. There was not a moment that I felt bored. They have awesome playlists here too which made me feel like I'm in a MV all the time. Otherwise, there's an ongoing runway show on their plasma TV at the back which you can watch. Major plus point: great lighting for selfies. Though not so good hair for that... will wait for Ryan to work magic on me. I was doing a Colour and Cut this time. After a consultation on the colour and the level of brightness that I wanted, Ryan went to prepare the hair dye quickly and returned within 5 minutes. He is probably the fastest among all my experiences. Then they started working the hair dye through my head... really doubly quick than the normal speed that I am used to - I was pleasantly surprised by that. There is also no ammonia smell and in fact the hair dye smells quite nice. I guess most salons are phasing out ammonia dyes... meanwhile I was busy flipping my magazines and reading on the latest gossip in the local entertainment industry. The dye was setting for 15 minutes. Ryan came over to check twice, which was really meticulous, and he gave me assuring nods that it's going well. Then it's time for a hairwash! I couldn't go into take pictures but the hairwash was gooood. I love this part of any hair appointment the most, because who don't love head massages?! Most salons don't put in much effort into it and concentrate on the washing, but I had an extended head massage that totally relaxed me. You would think that with so much going on - scrubbing and water jets, I wouldn't fall asleep but I did... They washed it at least 5 times to get all the dye out, and my hair was so fragrant and soft after that. Blow drying, and thereafter, Ryan did curls on my hair. Although his English is not very good, he was really very nice and patient as we communicate, constantly asking if I'm okay with everything and if the blowdrying and curling process is pulling too hard at my roots (it totally wasn't). He was really gentle and gives my hair a wonderful result too! Everything was done in 90 minutes which is very efficient. I was expecting more like 2.5 hours like the usual, but The Comb really impressed me with their efficiency. I love how my hair looks right now! The mahogany looks wonderful and my hair remains soft and gorgeous even after colour dye, without the treatment. I definitely look much better and this hair makeover lifts my whole look up. Will keep track of how my hair colour changes as I undergo a few more washes! My first experience with The Comb is a very positive impression. 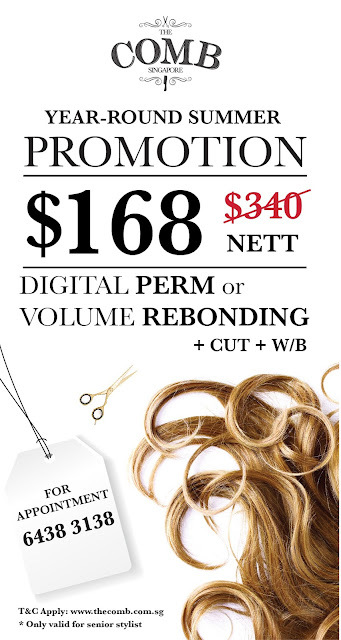 Enjoy 50% off when you get Volume Rebonding or Digital Perm + Cut by any Seniors Stylists! To top it off, we are also offering add-ons at only $80 each! *T&C apply and are subjected to the management's decisions. Call 6438 3138 for your appointment now! just started using nuhairrx serum and it's wonderful & works well on long fine hair leaves a good shine on the hair. I have been using nuhair rx serum for a month plus now. I continue to use it as advertised in the morning and the night. I could already see some improvement in the area, where I needed hair growth.